In April my son and I went to Nepal for a month. We completed the Annapurna Circuit over the Thorung La Pass (5416m) then tacked on the Annapurna Base Camp (ABC) trek before returning to Pokhara and Kathmandu. 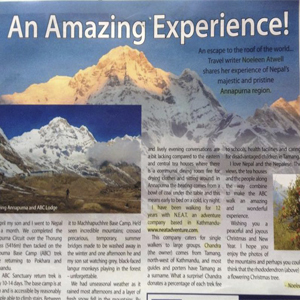 I Have been walking for 12 years with NEAT An Adventure Based company in Kathmandu. This company Caters for single walkers to large Groups. Chandra (the owner) originally comes from remote village of North-west of Nepal. What a suprise! Chandra donates a percentage of each trek fee to schools, health post and caring for disadvantages childern in Tawal (Tamang village). I love Nepal and the Nepalese. The views, the tea houses and the people along the combine to make the ABC walk an amazing and wonderful experience.